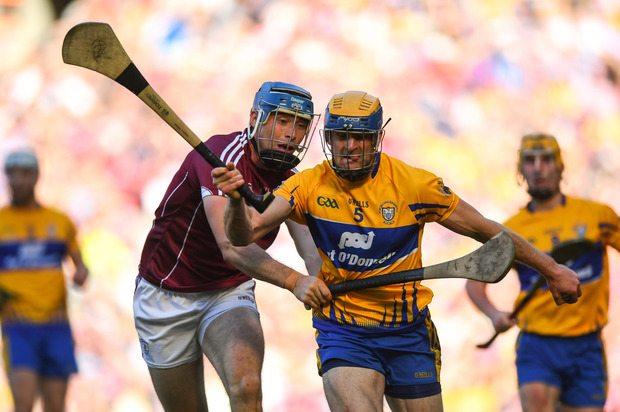 Seadna Morey of Clare in action against Conor Cooney of Galway during the GAA Hurling All-Ireland Senior Championship semi-final match between Galway and Clare at Croke Park in Dublin. Jonathan Glynn of Galway is tackled by Patrick O'Connor of Clare during the GAA Hurling All-Ireland Senior Championship semi-final match between Galway and Clare at Croke Park in Dublin. For some reason this evening, the public announcement system in Croke Park played the song ‘Raindrops Keep Falling On My Head’ as Galway and Clare huddled not 10 metres away from each other at half-time in extra-time in their instant-classic All-Ireland semi-final. Its musical whimsy couldn’t have been any more out of tune with the tension in the stadium at that very moment or the drama that was about to unfold. Less than a minute later, a long, high ball fell out of the dark evening sky to Clare sub Aaron Shanagher, who caught, spun and prodded a shot past James Skehill for a goal. It was the first time Clare led in the match. Not long after, Joe Canning limped off. Jason Flynn, Galway’s lavishly-talented substitute skied a goal chance over the Clare bar. Then, we had a fourth Hawkeye citation of the day and the fourth time the mechanism had ruled a Galway shot wide. The All-Ireland champions, the short odds favourites had led by nine points at one stage in the first half yet the little battles were being lost everywhere. And then – finally – we had what looked like the winner when Johnny Coen bent a shot just inside the Clare post. After almost 100 minutes of hurling, though, Jason McCarthy, the last of the Clare subs, ghosted into a pocket of space behind the Galway cover to slot over a relatively easy chance, albeit with an All-Ireland final place on the line. It’s been 1,764 days Clare last visited Croke Park. The 2013 All-Ireland final replay against Cork is a fading memory and this was shaping up to be a day to forget, the latest in a succession of disappointing summer exists since Davy Fitzgerald’s team lifted Liam MacCarthy. For the first 18 minutes of the first half of normal time, this was looking like the bleakest, most disheartening of the lot. Galway ate Clare during that period. Physically, they made Clare crushingly aware of their superior size, both in contact and in their snarling guard dog act on Donal Touhy’s puck-outs. Granted, his targets were far too static but Galway clogged Clare up, forced them into uncomfortable retreats in tight positions to win simple possession. And inevitably, Clare made simple mistakes. Galway’s hurling was pristine and direct by comparison. They went 1-7 to 0-1 up after 18 minutes, when Conor Cooney reacted quickest to Patrick O’Connor skewed pick-up attempt close to the Clare goal. Johnny Glynn’s posting was having the desired effect. Galway were finding Cathal Mannion in curious amounts of space. And then, as their season was going up in flames, Clare changed the shape of the game. Colm Galvin came back as a sweeper and Tony Kelly came noticeably deep in an attempt to influence the game. That served to give Touhy easier options off his puck outs while Peter Duggan began winning clean ball. Clare got it back to four points at half-time and they left Galway waiting for five minutes before they rejoined proceedings for the second half. Indeed, they were booed by the Galway supporters when they came back onto the field but it only added to the drama. Twice in that second half, Clare got level but Galway – through Joe Canning, Conor Whelan and Cathal Mannion – always found the vital score. As the clock ticked into the final minute of injury-time, Clare were awarded a free that Duggan nailed – his 13th. In a frenetic final minute, Johnny Coen and Ian Galvin both had chances to win but both fluffed their lines. Briefly, the added period was threatened by farce. After Clare’s delayed re-emergence for the second-half of normal time, word spread around Croke Park that Galway would not be leaving their dressing room until such time as Clare vacated theirs. Eventually, they came out in quick succession and two fraught halves of 10 minutes duration ensued. Therein, Clare hit seven wides and just a single point to Galway’s three points and three wides. The stakes couldn’t have been higher and it showed in some scattered passages. This time, the two teams stayed on the pitch in huddle and as the the rain fell and the evening darkened, Galway and Clare played out their most compelling, final act of the day. SCORERS – Galway: J Canning 0-11 (5f, 2 sideline), C Mannion 0-4, C Cooney 1-1, C Whelan, D Burke, J Flynn (1f) 0-3 each, N Burke, J Glynn, J Glynn 0-1 each. Clare: P Duggan 0-13 (10f), J Conlon 0-4, T Kelly (1 sideline) S O’Donnell 0-3 each, I Galvin 0-2 each, C Galvin, D Reidy, D Fitzgerald, J McCarthy 0-1 each. CLARE: D Touhy; P O’Connor, D McInerney, J Browne; S Morey, C Cleary, J Shanahan; C Galvin, C Malone; P Duggan, T Kelly, D Reidy; P Collins, J Conlon, S O’Donnell. Subs: D Fitzgerald for Malone (48), C McGrath for Collins (58), I Galvin for Reidy (61), A Shanagher for O’Donnell (67), O’Donnell for McGrath (82), J McCarthy for Shanahan (h-t e-t).